Iranian officials told a conference in Tehran January 9 that the country wastes about 2.2mn barrels of oil equivalent/d of primary energy. The energy intensity index is about 65% and growing by 5.5%/yr. The head of the Industrial Development and Renovation Organisation of Iran (IDRO) Abolfazl Kiani warned that if nothing is done to stop that trend, the country will face a “serious energy crisis” in less than ten years. But how much gas did reach final consumers? Iran produced 285bn m³ gross gas during 2017, re-injecting 29.3bn m³ into oil reservoirs to maintain barrels, according to an official document, prepared by the oil ministry and seen by NGW. The document says about 17.9bn m3 associated gas were flared that same year. According to the International Monetary Fund, Iran's GDP will fall from $430bn in 2018 to $333.6bn in 2019. Soaring associated gas flaring in 2017 came about because of the resumption of oil production from wells that had been closed during the 2012-2016 sanctions regime. Iran boosted oil output by about 1mn b/d to 3.85 mb/d when sanctions ended. The country also launched several new fields including the West Karoon block and the South Pars oil layer. Oil minister Bijan Namdar Zanganeh announced last year that it would cost about $5bn to curb flaring. The mentioned figures are only for associated gas, but there is huge loss of dry gas as well. 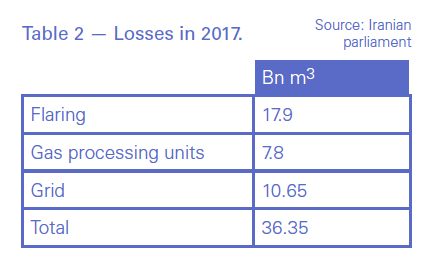 As well as the occasional emergency shut-down, gas processing units also burned 7.8bn m³ in 2017, growing 17.33% year-on-year. The growth is due to the operations of new processing units in the giant South Pars gas field, which accounts for three quarters of the total amount of gas lost in this way. Almost all of Iran’s gas production growth during the last few years has come from South Pars, which accounts for 70% of the total production. Iran has not increased gas production in 2018, but it is preparing to operate five new phases of South Pars with 45bn m3/yr capacity in 2019 and the gas loss is expected to increase in new processing units, which wastes initially about 4% of gas. Iran says it would optimise the new processing units gradually. The document also says that about 10.65bn m³ were lost in grid and distribution systems during 2017. Therefore, calculating all the above-mentioned losses in the upstream sector, processing units and grid, Iran lost 36.2bn m3 gas during 2017 and less than 220bn m³ of gas either reached the final consumers, or were exported. The gas loss is not expected to rise in 2018 owing to a very low production increase and the 1mn b/d cut in oil price following the resumption of sanctions a few months ago. These losses are only the tip of the iceberg. Iran delivered about 65bn m³ to power plants in 2017. The efficiency of thermal power plants in Iran is about 30%, which is about half as efficient as the best available. The document says about 462mn boe (83% gas and 17% liquid fuels) were supplied to power plants and the final electricity energy was equal to 152mn boe. But about 11.93% of the generated power was lost in grid during 2017 as well, the document says. 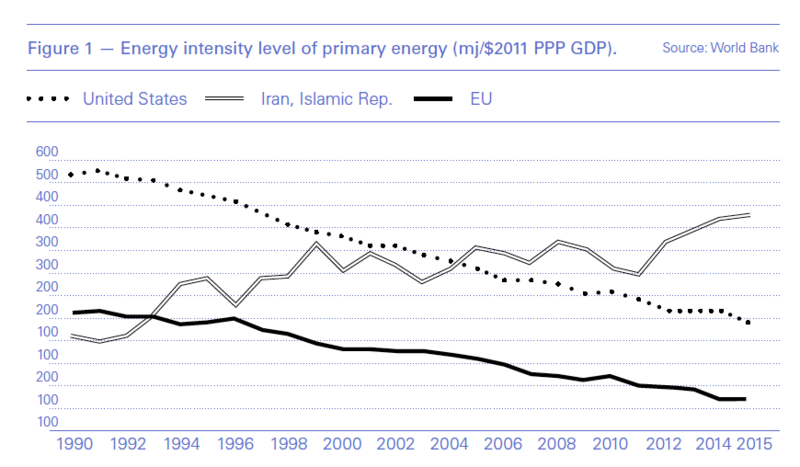 Iran’s energy intensity index is very high but halving it would cost $200bn. Iran’s agricultural, industrial and housing sectors uses 3.3 times, 2 times and 1.5 times more energy respectively compared with global averages according to Iran Fuel Conservation Organization (IFCO). Households consume about half the gas supplied to the domestic market. The sums of money needed to address the losses will not be easy to find. The research centre of Iran's parliament released a report January 13 saying that National Iranian Oil Company’s foreign and internal debts reached $48.66bn last year; but the plans to pay them off look optimistic. The paper says that for the next fiscal year, which starts March 21, NIOC should repay $15.7bn of debt, but the company’s total projected "reliable" revenues and budget are less than a half that sum. Parliament’s research centre says that NIOC can only rely on $7.5bn from domestic and export sales of hydrocarbons in the next financial year. Foreign investments have been hit by US sanctions, for example driving away the French major Total from its plans to invest in South Pars; while its own heavy debts and delays in payments make it an unattractive borrower at home. “NIOC should also invest $8.76bn in oil and gas projects, but there are not even reliable sources for paying off debts,” the report said. The report says NIOC is expecting to have $24.49bn to spend next year, made up of $4.48bn in oil and gas export revenues; $4.4bn in foreign loans and investments; and $5.94bn in loans from domestic banks for the next fiscal year. The rest is expected to be allocated from the national development fund (NDF) and other sources, according to the budget bill. Iran eyes $32bn crude oil, gas condensate and gas export revenues for next fiscal year, of which 14.5% (about $4.48bn) would be allocated to NIOC, 20% to NDF and the rest to the other sectors. According to the budget, Iran eyes 1.54mn barrels/d of crude oil exports at $54.1/b; and 135,000 b/d of gas condensate sales to domestic petrochemical plants at $51.4/b. The budget also predicts $3.45bn of natural gas exports to Turkey and Iraq, two thirds of which revenues would come from Turkey. The US has also granted a waiver for Iraq to continue Iranian gas intake until March and it is not clear whether it plan to extend that or not, though Iraq says that Iranian gas is needed for its power plants for at least two years while it boosts its own production. Iranian oil exports are under 1mn b/d and US recently announced that it has no plan to extend waivers for buyers of Iran’s oil after May 2019.